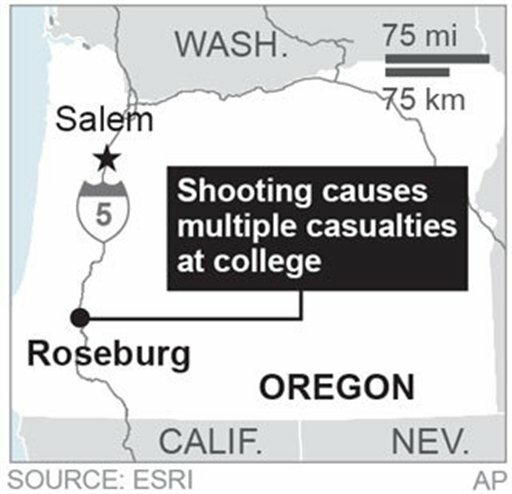 ROSEBURG, Ore. (AP) —A gunman opened fire at an Oregon community college Thursday, killing at least 13 people and wounding 20, authorities said. 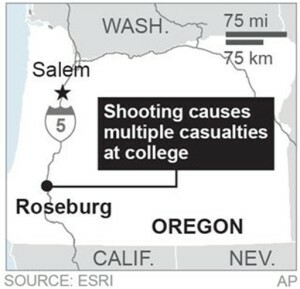 Oregon Attorney General Ellen Rosenblum said 13 people are dead. State police Lt. Bill Fugate told KATU-TV that at least 20 others were hurt. 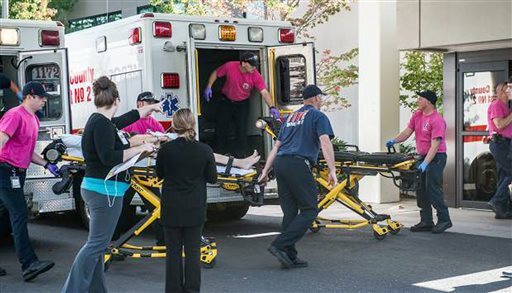 A photographer for the Roseburg News-Review newspaper said he saw people being loaded into multiple ambulances and taken to the local hospital. Neither state police nor the sheriff’s office immediately returned calls from The Associated Press seeking details. The sheriff’s office reported on Twitter that it received a call about the shooting at 10:38 a.m. Students and faculty members were being bused to the county fairgrounds, the sheriff’s office said. “We locked our door, and I went out to lock up the restrooms and could hear four shots from the front of campus,” UCC Foundation Executive Director Dennis O’Neill told the News-Review. Story by JEFF BARNARD, Associated Press. 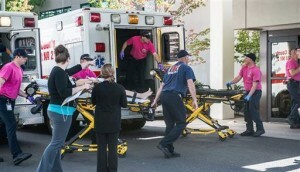 Associated Press writers Steven Dubois in Portland, Oregon; Martha Mendoza in Sana Cruz, California; and Gene Johnson and Donna Blankinship in Seattle contributed to this report. Brace yourselves…. the fantasy world people are preparing their posts about rainbows and unicorns and how making guns illegal will keep them out of the hands of criminals. Brendon, Mensa Member; yea, you! These kids that are committing these atrocities aren’t criminals. They got their guns legally. Are you really that dense! Criminals, in the gun climate today, don’t have to get their guns illegally, you piece of penile intellectualism. And, if what you say is true, then why doesn’t Canada, or Australia, or Great Britain, or France, or Scandinavia have a problem with criminals having guns? Oh, that’s right, because they don’t. Oh, and by the way. They are all STILL free democracies. No dictatorships. (Of course, that might not be true for this country if the GOP get elected). All of you raging intellects out there – we DO NOT HAVE TO PAY THIS PRICE TO KEEP OUR FREEDOM. Take a chill pill. LOL.! I’m waiting for the gun lobby trolls and NRA shills to post that every one needs a gun. Even though those states who have more restrictive gun laws have fewer gun deaths. And lets not forget China. The same day as 21 babies were being blown to bits by a military rifle and ammunition in the US. If knives are just as dangerous, remember the 21 students a crazy person stabbed in a school – all survived. Think about this: Australia is a Democracy, they have not lost any freedom with restrictive gun laws, but no mass shootings. Canada is a Democracy, they have not lost any freedom with restrictive gun laws, but no mass shootings. Great Britain is a Democracy, they have not lost any freedom with restrictive gun laws, but no mass shootings. Wake up before it happens to someone you love. Because statistically, it is going to. 30000 gun deaths a year. This is a terrorists attack on this country by the NRA and the gun lobby. They are terrorists. And any one who agrees with them are TERRORISTS. Maybe you should get a prescription for prozac. because you sure could use it. I really don’t think that this is a gun issue, its more about how about how mentally ill people are able to get guns in the first place, There are so many guns around , that they will never be eliminated, even in three generations. The real problem lies in how the medical sector shares personal information about mentally ill people, and this comes back to state and federal laws that protects peoples personal information, its not just the state and its not just the feds, but its the personal information laws that are allowing these nut jobs to get guns in the first place. They can make all the gun laws they want, but there are so many out there, that it is a lost cause. I am a little confused. I many people actually died? Did 9 people? 10? or 13? One group that tracks gun violence, the Mass Shooting Tracker, said it was the 294th death or injury from a shooting involving four or more people in the United States this year — a rate of more than one victim a day. School shootings have figured prominently in this series of tragedies, including the 1999 massacre at Columbine High School in Colorado, the 2007 Virginia Tech shootings and the deaths of 20 children in 2012 at Sandy Hook Elementary School in Newtown, Conn.
It’s a good thing he didn’t use a car to run over them. because you want to outlaw cars.. go outside and get some air. Nothing but sorrow this morning. The levels of hate and violence have escalated dramatically in the last few years, stoked by people and events who seem hell-bent on bringing the worst to the lives of others instead of the best. The judgmental attitudes, the backlashes against those attitudes, the availability of guns, the contentious nature of our society is a toxic combination that will be with us now for the long haul, it seems. Nothing but sorrow this morning.